A Decade of daybreak: Family Fun Day Celebrations! In 2004, daybreak nurseries opened the door of Amersham Town Centre nursery. 10 years on and over a thousand children later, daybreak nurseries, a local and independent nursery group, has expanded to comprise of four nurseries in the area. To celebrate a decade of daybreak, the nurseries in Amersham hosted a Family Fun Day on 2 August, inviting parents and children to an afternoon of fun-filled activities. 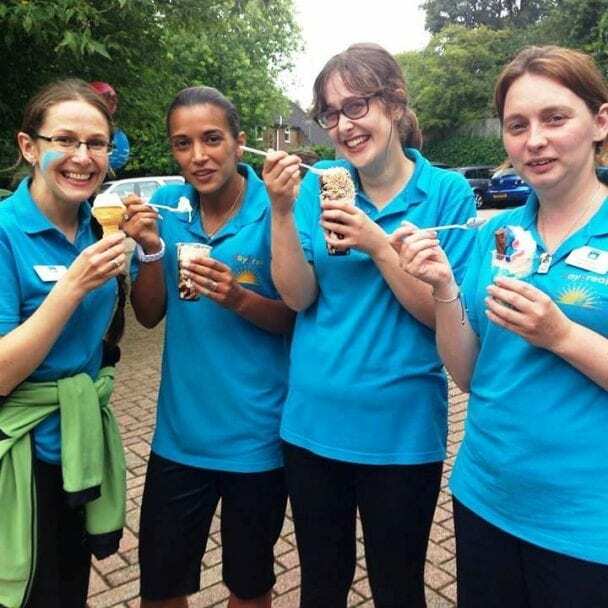 From 2-5pm, the children were treated to complimentary ice-creams and lollies from Mister Whippy ice-cream van, as well as a slice of celebration birthday cake! Face painters were on hand to transform the children in to their favourite animals and a bouncy castle helped keep the children entertained – despite the afternoon downpour! The very special guest of the afternoon was Peppa Pig, a firm family favourite who surprised all the children with the chance to meet and cuddle the popular costume character. Sarah Dodds, Director of daybreak Nurseries, comments, “As well as our 10 year anniversary, this year has seen the opening of the brand new Amersham Chiltern Avenue nursery, the first dedicated pre-school only nursery in the group and unique to childcare – a dedicated nursery for babies at the existing nursery – so we have much to celebrate in 2014!! Following the event for all the families, on Saturday 6 September, daybreak Nurseries held a celebration party for all 80 staff from across the four nurseries. A black tie event held at The Fairway Inn in Rickmansworth celebrated a decade of daybreak with cocktails, an awards ceremony and dancing until the early hours! For further information, or to make an appointment to visit daybreak nurseries and see this unique environment for yourself, please visit www.daybreaknurseries.co.uk or call 01494 727701 (Amersham Town Centre) or 01494 721921 (Amersham Chiltern Avenue). From daybreak to dusk (7.30am-7.00pm), daybreak nurseries offers flexible, professional and trusted childcare for all busy parents. So whether you have a 3 month old baby needing love and care all day everyday, or an 8 year old requiring a stimulating after school club, daybreak is here to help.